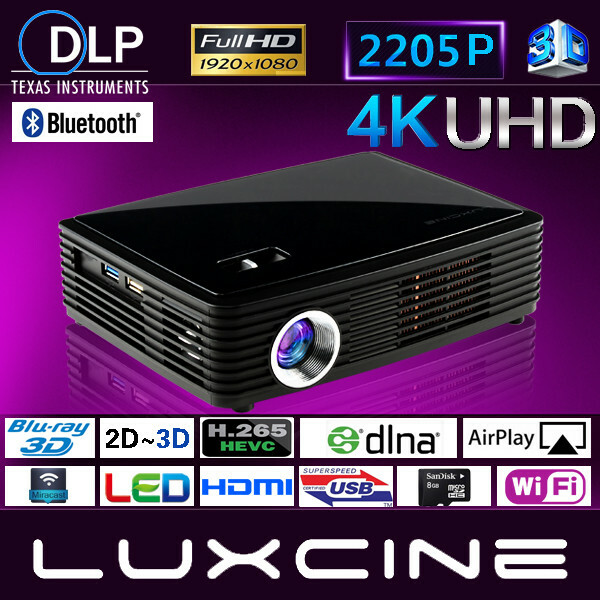 Successfully Added Smart Projector DP80 - 4K Support, 3D Media Support, Android OS, Dual-Band WiFi, 3500 Lumen, 250-Inch Image Size to your Shopping Cart. Turn any dark room into your own private cinema with the DP80 smart projector. This stunning Android projector allows you to watch movies, play games, and use Apps at any given moment. It supports Dual-Band WiFi which means that you can browse the web straight from your projector. What really sets this beauty apart from the rest is its 4K video support. Thanks to this, you’ll be able to enjoy the latest 3D media and 4K ultra-HD movies, series, and sports games without ever dropping a frame. The native HD resolution of this DLP projector treats you to crisp visuals and stunning color. With this Android projector at your side, you’ll always undergo nothing less than a cinematic experience when watching a movie at home. Packed within its body, this Android projector holds a sophisticated processor and 1GB RAM. This hardware supports you in enjoying all the basic Android features out there without ever running into any lag. Simply head out to the Play Store and download your favorite media for free. With the DP80 smart projector, you never have to feel bored again. The powerful light of this DLP projector puts forth a whopping 3500 lumen for a clear experience in any type of environment. The projector supports a 0.3 to 5m throw distance and a 10 to 250-Inch image size. With its dual 4W speakers, it does not only deliver great visuals but outstanding audio as well. Whether you use this gizmo for basic Android games, App, movies, or presentations - the DP80 is guaranteed to meet your demands. This smart projector comes with a 12 months warranty, brought to you by the leader in electronic devices as well as wholesale Android projectors..